Established in 1969, Circle One have been at the cutting edge of innovation in the surfing world. Offering a huge range of surf hardware they are well worth a good look. Perfect Day Surf School, Strandhill, Sligo offers a Circle One Test-Drive center. This is the ideal way to try different sizes and shapes of Circle One surfboards and find the one you want. Here at Perfect Day Surf School Strandhill we run a Circle One Test Drive center. You can come and try any surfboard in the Circle One range… free of charge. Buying a surfboard is a big investment and getting it right is essential, particularly for the first board. So why not come and try some of the Circle One board before you make that big investment. The first tip I would give to any beginner is to take a few surf lessons at an I.S.A approved surf school, like Perfect Day Surf School, Strandhill. Preferabley somewhere where you will receive coaching in a structured small group lesson. Little can be gained from being stuck with twenty other beginners in a surf lesson. Once you mave mastered the basics and are aware of potential dangers etc, you may be keen on getting your own equipment. At this stage is is critical that you get a surfboard that is going to suit you and aid your progress. Being sold a board that does not suit your size, weight and athletic ability will lead to frustration and annoyance. Seek advice from someone who knows what they are talking about. Dont rush into buying your first board. Stay safe and enjoy. Like Kermit the Frog once said, ‘It aint easy bein’ green…’ neither is it easy refining the art of Hot Dogging. It takes time and practice. But you’re in this surfin’ thing for the long haul right? So, let time take it’s course. All clear? Commit to the wave – paddle hard: long, strong, even strokes. Keep looking UP! See where you want to go. Pop! Jump front foot between your hands, let your back foot trail just behind. Steady as she goes; keep your centre of gravity low, arms out, front hand pointing where you want to go. 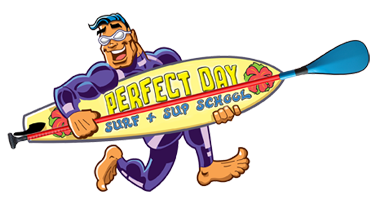 Here at Perfect Day Surf School we run small group and individual surf lessons. We have a unique one instructor to five surfers ratio as opposed to one to eight elsewhere. This ratio maximises the Safety, Coaching and Fun in our lessons. Because of our small class size our surf lessons book out early so dont be disappointed… book your session today. Mahalo. Wild and windy all week. Swell going huge this weekend. Add in gale force westerlies and its a bad mix for Strandhill. Stay safe.